(0 Customer Reviews) | Write Review 12 issues per year The Dental Technician sets out to be the cornerstone of news, comment and educational content for dental technology today. We are gradually growing our spread of interesting articles from some of the best technicians and teachers in Britain and Ireland. Our aim is to remain the number one topical and reference source for you, our professional readership – staying on top of the changes in technology and being tuned to events and breakthroughs as they happen. We will this year be adding an interactive website with CPD available on-line, and a real job vacancies programme appealing directly to the interested and motivated technician with an ambition to be the best in whatever area of technology they have chosen to work within. Let us continue to make the The Dental Technician our journal. The Dental Technician Magazine celebrates its platinum year from its foundation in 1947. We are proudly progressing and, under new ownership, we are setting out to be the cornerstone of news, comment and educational content for dental technology today. We are gradually growing our spread of interesting articles from some of the best technicians and teachers in Britain and Ireland. Our aim is to remain the number one topical and reference source for you, our professional readership – staying on top of the changes in technology and being tuned to events and breakthroughs as they happen. The Dental Technician sets out to be the cornerstone of news, comment and educational content for dental technology today. We are gradually growing our spread of interesting articles from some of the best technicians and teachers in Britain and Ireland. Our aim is to remain the number one topical and reference source for you, our professional readership – staying on top of the changes in technology and being tuned to events and breakthroughs as they happen. We will this year be adding an interactive website with CPD available on-line, and a real job vacancies programme appealing directly to the interested and motivated technician with an ambition to be the best in whatever area of technology they have chosen to work within. Let us continue to make the The Dental Technician our journal. You'll receive 12 issues during a 1 year The Dental Technician Magazine magazine subscription. 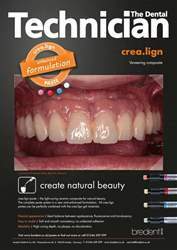 You'll receive 12 issues during a 1 year The Dental Technician Magazine magazine print subscription.